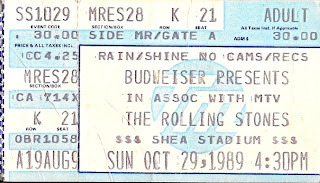 When the Rolling Stones rolled their Steel Wheels Tour into New York City it was for six sellout nights at Shea Stadium in October 1989. It was their first Tour since 1981. After years of inactivity and Mick & Keith feuding publicly, it seemed the Stones were doomed. But they made nice after the Rock & Roll Hall of Fame ceremony and wrote about 50 songs in a month. Made their first new album in 8 years and released "Steel Wheels" to good reviews. It was a real good album sporting new hits like "Mixed Emotions"(which went to #5 on the U.S. charts) and "A Rock in Hard Place".The album went double platinum in the U.S.
All six nights sold out immediately as they went on sale,averaging 65,000 people per night. I can remember waiting on a Ticketmaster line for hours as new shows kept getting added. My Mezzanine seat in Section 28 cost $30 at the time. I can remember the Mezzanine section shaking up & down some thing I only felt at the 1986 Mets season clincher game before that. By far it was one of the best shows I ever saw. The opening act was a new band at the time called"Living Color" fresh with their hit "Cult of Personality". (What ever happened to them?) The Stones did a two hour set of classics and some new songs from the Steel Wheels album. There were two 50 foot inflatable women blown up to life on both sides of the massive stage set up during "Honky Tonk Woman". The stage was a massive erection of steel ramps for Mick to dance around on and large video screens so the fans could see the show,even from the depths of the upper decks. The Stones received $70 million up front guarantee for the 36 city tour and probably made alot more as the Steel Wheels rolled on. 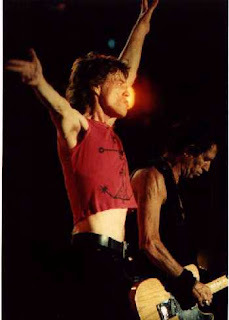 Parts of the tour were filmed for the first ever Rock show shown at imax movie theaters called 'Rolling Stones at the Max". If Opening night wasn't enough of an event, Eric Clapton showed up & played guitar on a version of "Little Red Rooster". This would be the last tour bassist Bill Wyman would play on as he would retire in the early nineties. I believe it was the first time the Stones played the Psychedelic "2000 Light Years From Home" too. The Who sold out 2 nights at Shea Stadium in two hours. It was their first return to a New York Concert stage since the 1979 "Who Are You Tour" right after Keith Moons death. The band had kind of decided to call it quits after this tour but still were not really sure. At the time it seemed this would be the end, the Kenny Jones on drums years just wasn't working out anymore. Pete Townshed hated playing the stadium shows but because of their huge popularity, they forged ahead anyway. Their latest album at the time was "It's Hard" which I think is still a great album today,as I did in high school back then. I still have the 1982 tour shirt from the show that certainly hasn't fit in years. 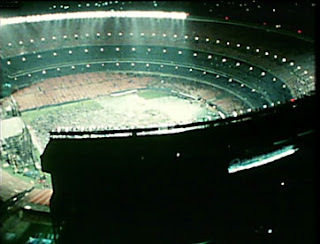 This concert was the first time that seats were put on the infield for a concert at Shea Stadium. Adding another 9,000 seats. Huge video screens were the new thing and the Who had the state of the art version for its time. They were sporting their new early eighties New Wave hairstyles, as Roger Daltrey had cut all his long curly locks off. The opening act was the one of the hottest bands around at the time, The Clash. Many Clash fans were there just to see them. They had their new album at the time out "Combat Rock", and they were chosen by the Who because they were thought of as the future of rock.It was the beginning of their end as the Clash soon broke up, and the Who continues to roll on every few years. Personally I never thought the clash were anything beyond "London Calling' & "Lost In the Supermarket", to me just highly over rated. I also remember it raining for the concerts too. Bruce was highly motivated after the 911 tragedies and put together the first E-Street band album since "Born in the U.S.A." in 1985. It was a huge success and a massive two part world tour of 120 shows followed. 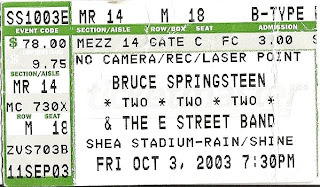 The tour began in New Jersey in August 2002 and ended at Shea Stadium for three nights in October of 2003. An estimated 200 million people saw the shows around the world. Bruce did an incredible 10 nights at Giants Stadium alone grossing $ 39 million dollars with an estimated 600,000 people in attendance. The final three nights of the tour at Shea did have a few empty seats, and most people in attendance had already seen a few shows of the Tour. 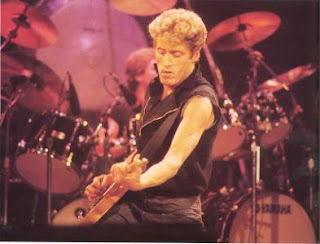 The tour featured a new E-Street band member Soosie Tyrell on violin & backing vocals. The band intros were done during a marathon version of "Mary's Place' and the classic"Badlands" always brought the crowd to their feet, and was a mainstay of all songs in the varying set lists. Bruce concerts were always known for the pre concert tailgate parties,especially at Giants Stadium. Well Shea discouraged any tailgating and announced it on the news, the radio and on their web site. any partying was done very low key as the NYPD patrolled the parking lots, bummer man. Bob Dylan made an appearance with Bruce on the final night of the tour at Shea and the two did "Highway 61 Revisited". Sting said "I'd like to thank the Beatles for letting us use their Stadium" during the Police's 1983 concert. At the time the Police were at the height of their popularity and the hottest ticket in town. They squeezed an estimated 70,000 into Shea that night as the fans watched three video screens project images of The Police modifying renditions of all their hits. Sting was very full of himself and hammed it up, while Stewart & Andy jammed on. It was a great performance and the Police legend grew even bigger after this show. The opening act was local girl Joan Jett and the Blackhearts. The former Runaway was hot off her 1981/1982 album and hit "I Love Rock & Roll" and currently supporting her latest album called album. I always liked Joan Jett and she always puts on good live show. The other opening act that were so unknown at the time they didn't get any billing was R.E.M. sorry I have no use for these guys at all.